Why is animal agriculture so bad for the planet? Inefficiencies on a massive scale + subsidies + social norms = unsustainable disaster. When we eat plant-based foods, we are primary consumers of plants. When we eat animal-based foods, we are secondary consumers of plants. Because animal agriculture is based on secondary consumption, it uses up far more resources than it provides. Animal foods are essentially just secondhand plants (minus fiber), but greatly reduced in yield. It does require less feed to graze or pasture farmed animals, but doing so requires vast areas of land that are wildly disproportionate to the comparably small resulting food yields. In fact, animal meat and "products" (like dairy and leather) have long been considered symbols of status and prestige precisely because of their extravagantly high resource cost. Despite its monopoly on farmland and frequent greenwashing to try to justify it, animal agriculture will always be inherently less sustainable than plant-based. Continuing to exploit animals for food in the absence of necessity is outdated, inefficient, and cruel. Now imagine the tens of billions of farmed animals on our planet all wasting food in this way. Although varying in severity, this inefficiency occurs with every type of farmed animal, even farmed fish. Although chickens are considered the most "efficient" of farmed land animals, the FAO reports the greatest tonnage of the world's feed actually goes to poultry – and WWF reports that feed production is responsible for the bulk of the environmental impacts of meat-based diets. — A Well-Fed World, "Feed:Meat Ratios"
— Professor Mike Berners-Lee from Lancaster University who specialises in climate change and sustainable food systems. The highly disproportionate scale of animal agriculture is far bigger than most people realize. It is the largest land use system on Earth. Constantly breeding and feeding tens of billions of farmed animals is monopolizing much of our planet and its natural resources. It is undeniably a primary cause of ecological overshoot. One shocking result of turning our planet into what is essentially a giant meat/dairy/egg factory is that wild mammals now make up only 4% of the biomass of all mammals on Earth, largely replaced by our selectively-bred, domesticated, and confined "livestock" like cows and pigs who now make up a staggering 60% (while 36% are humans.) Of birds, 70% are farmed "poultry" like chicken and only 30% remain wild. 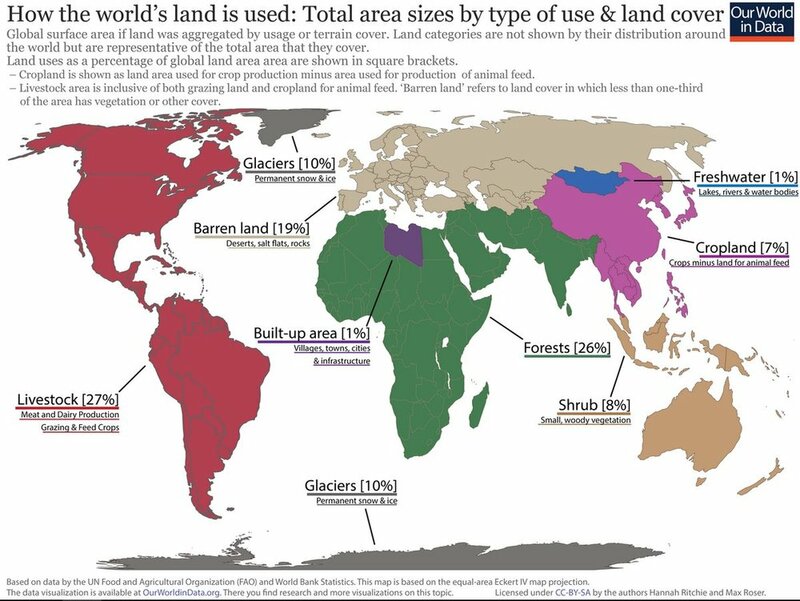 The below chart shows just how much of our global surface area is occupied by so-called "livestock" systems. By "everything else," shown in blue, we mean literally everything else on Earth outside of the giant animal agriculture/slaughter system. That includes plant-based agriculture, houses, buildings, parks, wildlife habitats... you get the picture. Below it is a second estimate that is smaller but still tremendous. Clearly, no conversation about overpopulation and overconsumption is complete without focusing on the role of human demand for animal exploitation products. 319 million people vs. 10 billion farmed animals. Source: USDA, reflects human population and population of farmed animals raised and killed in the US, both in 2010. The huge material cost of animal-based foods is ingeniously masked. Hardly any farmer can afford the large amounts of land and resources needed for the extravagant undertaking of animal food production – and they generally don't have to, because taxpayers are forced to pick up the tab. Consumers then interpret the artificially lowered price tag as the true cost, when the externalities are actually much higher than reflected. 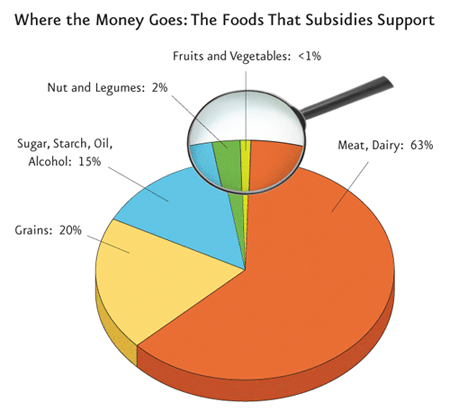 Therefore, our food choices are largely dictated by these subsidies that disproportionately favor animal-based foods. The true health and environmental costs are simply being deferred to everyone's future. In 2013, $53 billion went to "livestock" subsidies in the 35 countries affiliated with the Organisation for Economic Co-operation and Development alone. This issue is further contextualized by Lisa Winebarger, JD, who argues that the US subsidization of animal agriculture violates the UN framework convention on climate change. These subsidies occur even without consumer demand. For example, a whopping 73% of the returns received by US dairy farmers are a result of dairy subsidies. Yet in 2016, a record amount of 43 million gallons of cows' milk were dumped or "lost" by U.S. dairy farmers who are still paid to produce milk no one wants to buy. Further, that year the US government pushed 11 million pounds of unwanted dairy cheese sitting in "surplus" on school children in nutrition assistance programs – the majority of whom are part of populations that can't comfortably digest it – via a $20 million dollar dairy industry bailout. Not only do we subsidize production, we also pay to clean up the mess. For example, tens of millions of dollars in taxpayer subsidies are going to fund "anaerobic digesters" to try to minimize the pollutants in manure from millions of bovines being farmed for products no one needs. Additional handouts come in the form of programs such as “Animal Disease & Disaster Prevention Program," enabling the miserable conditions that threaten public health while offsetting the costs to taxpayers. Plus, the "livestock" industry exerts disproportionate power. The cultural capital of "cowboys" and other animal farmers, along with their massive lobbying power ($2,494,915 in 2017) and the revolving door between agribusiness and government roles, results in special treatment like exemptions from ecological studies, reporting, regulations and more. In fact, the first ever index of its kind has found that of the 60 largest animal meat, fish, and dairy companies, almost two-thirds are either not managing environmental, social, and governance (ESG) risks or are failing to disclose basic information. The risks listed include greenhouse gas emissions, deforestation & biodiversity, water scarcity and use, waste and pollution, antibiotics, animal welfare, working conditions, and food safety. The animal agriculture industry is getting away with murder in a myriad of ways. Yet time and time again, despite undeniable growing scientific consensus, it's noted that there is a reluctance to address these issues with the public. So... why don't more people care? The deeply entrenched and institutionalized social normativity of animal use/consumption means our society remains largely complacent even when faced with the above information. Additionally, an almost belligerent resistance to and social stigma against veganism is a result of the taboo nature of openly rejecting and challenging animal consumption, seen universally as a sign of status. Because most people (including those in the media) are still not vegan, the dominant narrative surrounding veganism is largely crafted by individuals who fundamentally don't or won't understand it or even have vested interests in continued animal production. As children, we accept half-baked explanations for how and why we eat and otherwise use animals, and most people never go on to challenge these shallow rationales even as adults. Despite the fact that it's outdated, inefficient, and cruel, pervasive animal use is deeply woven into many aspects our lives. Not only is it institutionalized, it's often romanticized and constantly reinforced by many common rationales and myths. Frank, honest discussions about the staggering ethical, environmental, and health consequences of animal use can feel deeply uncomfortable and confronting. Unfortunately, when it comes to this topic, a desire to soothe one's cognitive dissonance is usually stronger than a willingness to look within and make changes that defy social norms. How to effectively break through this passivity remains the million dollar question, but being informed and sharing information in a compassionate and thoughtful way that acknowledges these roadblocks is a great place to start. Note: See the Myths section for much more info on these topics and more. 1) What about grass-fed / free-range / pastured? Farming animals stretches our environment beyond its limits with or without factory farms. Pasturing animals actually uses even more land for an even smaller yield, so only a small portion of the population can be fed that way (as this global calculator built by an international team demonstrates). In fact, this is why factory farming began, and it's impossible to meet a fraction of our current demand without it. If factory farming went away, animal production would occupy even more space – yet most people would be priced out of animal consumption due to scarcity. A Harvard study published in Environmental Research Letters finds that shifting all beef production in the U.S. to pastured, grass-fed systems would require 30% more cattle, increase beef's methane emissions by 43%, and would require far more pasture than is available. The study also notes other environmental harms that would likely result from a shift to all or mostly grass-fed beef production. And in case you've heard that grazing domesticated animals is actually beneficial for the environment, this unsubstantiated claim made by ranchers has been thoroughly debunked by a new 2-year study citing 300 sources. ""In other words, grazing livestock – even in a best-case scenario – are net contributors to the climate problem, as are all livestock." Despite how old methods of animal farming are romanticized, so-called livestock were non-existent in North America before colonization. Yet animal agriculture's monopoly on our land and resources has been happening for a long time; it's just becoming more urgent with growing human population/consumption. Replacing industrial animal farming with more grazing/pastured systems will not solve the problem. 2) Aren't vegan diets "a waste" of marginal land? Vegan diets require far less land. Per a massive 2018 study, a global vegan shift would free up land equivalent to the size of the US, China, European Union and Australia combined. Therefore, we wouldn't need to use marginal land to graze domesticated animals. More land could be returned to wild habitats performing invaluable ecosystem services, rather than converted to what is essentially yet more office space for animal agriculture. We don't need to "turn grass into steak;" we need to eat human-edible plant foods, allowing more grasslands and forests and other habitats to be re-wilded or remain undisturbed. Besides, the idea that poor quality soils can only support animal production is a widely held yet non-supported assumption. Examples of hardy, human-edible plants that grow in difficult conditions include leafy greens, fruit, roots, buckwheat, rye, barley, quinoa, amaranth, and several leguminous plants and food trees. See our resource on this topic. 3) Why not just focus on eating local? Although the "locavore" movement is very popular, "food miles" present an incomplete picture. Studies show that transportation only accounts for 11% of the total emissions produced by a food, while 83% are released during production (before the food leaves the farm). The production of animal foods is inherently more resource-intensive and less efficient, regardless of how far the animals' flesh and secretions are transported. — The New York Times, "What You Can Do About Climate Change"
4) But isn't veganism a privilege? Food choice is the privilege. Vegan diets are just one form of food choice among many. Having unlimited access to animal foods is also a privilege, so this accusation is a double standard. As developing nations gain wealth, demand for meat and dairy (not beans and rice) grows because of the luxury status/high resource cost of the former. Meanwhile, per the Economist, "The desires of rich carnivores often trump the needs of poorer cereal consumers." Those of us with access and autonomy can use our privilege for good and dramatically reduce the strain on the global food supply by shifting to a vegan diet. See our blog post on this topic for more. 5) Doesn't sustainable small-scale agriculture need to include animals & manure? The locavore movement defaults to a vision of small-scale agriculture that includes farmed animals, often positioned as the only alternative to industrial agriculture (therefore serving to further delegitimize veganism). But this is a false dichotomy. Biodiverse food systems can and do exist within a framework that eschews animal exploitation. Believe it or not, veganic farming is actually nothing new. North American indigenous agricultural systems didn't use domesticated animals before the colonists came along. The highly efficient milpa system in Mesoamerica (based on corn, beans, and squash) fed what was likely the densest population on the planet at the time without any animal inputs, including draft animals. Basic laws of biophysics show that secondary consumption of plants is far less efficient than primary consumption. Yet nearly half of the global surface area is being used to graze and/or cycle feed crops through tens of billions of animals, even though most of those calories are burned up to power their bodies and it's an inefficient use of land. Whether farmed animals are pastured locally or factory farmed far away, these inherent inefficiencies on an epic scale result in a massive yet largely overlooked waste of resources and cause of pollution. Vegan diets get around this needless inefficiency and therefore have a much lighter environmental footprint – and a vegan shift must go hand in hand with agricultural shifts that include ending animal agriculture subsidies along with a cultural shift shattering the taboos surrounding these topics. Now that we've covered this overview, let's dive into some more specific areas.